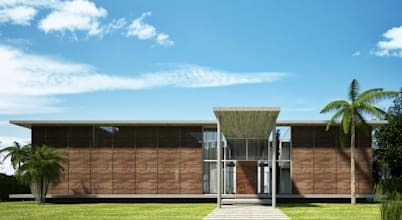 This homify article takes you to the beautiful town of Key Biscayne in South Florida, wherein architects from the Miami based FERNANDEZ ARCHITECTURE have lent their expertise to create a beautiful haven of 3500 sq.ft. offering modish comfort & stunning views. This elegant home costing US$4,500,000 was designed with entertainment & sustainability in mind. With remarkable waterfront views & lush landscaping, this tropical-style home boasts of the perfect environment for the South Florida climate. The home exemplifies contemporary comfort, absolute elegance, and neat minimalism with concrete finishes & wooden elements. Abundant glazing and a lovely pool adorn the backside of this home. Encompassing greenery & sea-views make for a really palliative stance. Once inside, bright spaciousness and absolute style take over. Jazzy lighting fixtures, floor-to-ceiling windows with curtains, plush furnishings & a spectacular neutral palette greet you. The most interesting aspect is that despite the lavishness, minimalism clearly comes across. Nowhere does the architectural design or the interior decor seem overwhelming, and there is a substantial connection with the outdoors in every home space. Curious to explore? Here we go!